PLAINVILLE, Mass. 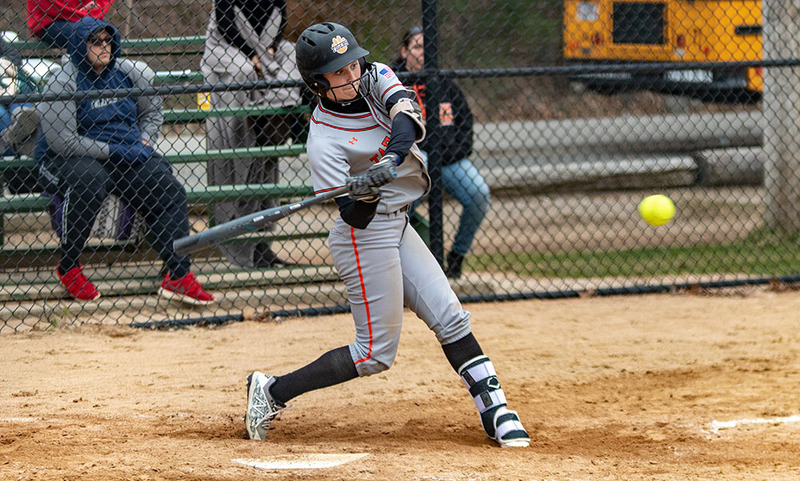 – Going on the road and picking up a win against King Philip at the Plainville Athletic League Complex is no easy feat. In order to accomplish that, the Taunton softball team knew it had to play a complete game. The Tigers did just that, playing well in all facets of the game to score a 7-0 victory over King Philip in an early-season showdown between two of the top teams in the Hockomock League. PAL has been a house of horrors for visitors with the Warriors winning 22 contests at home over the past two seasons and a winning streak against league opponents dating back to 2016. Fittingly, the Tigers were the last team to win a league game at PAL, back in 2016. Taunton was on the verge of a win last season before a seventh inning rally resulted in a walk-off win. This time, Taunton jumped ahead early, building a 5-0 lead through three innings and that lead was more than enough for sophomore pitcher Kelsey White (CG, 2H, 4K). Sophomore Hanna Aldrich was the catalyst for the Tiger offense. In her first at-bat, she launched a two-out solo home run over the fence in left field to put the visitors up a run after an inning. Eighth-grader Ava Venturelli led off the top of the second with a walk for the Tigers and advanced to second on a sacrifice bunt from Alexa White. A double off the wall in right from Paige Silvia put runners on second and third. Payton Ceglarski brought Venturelli home with a sacrifice fly into right field with Raegan Simeone making a terrific running catch and nearly getting the runner at home with a great throw. Silvia, who moved to third on the sacrifice, came home to score on a passed ball to make it 3-0. After allowing a two-out single in the bottom of the first inning to KP’s Faith Turinese, Kelsey White retired the side in order in the second, getting a strikeout and two ground balls. Taunton’s offense was back at it again in the top of the third. Kelsey White reached on a bunt with one out and Aldrich delivered again. This time, Aldrich smashed the second pitch she saw well over the wall in left for a two-run homer and a 5-0 lead on the scoreboard. King Philip’s Grace Kelley reached on an error to start the bottom of the third but White got a pop up to center, erased the lead running with a grounder, and another out to left to prevent any damage. The sophomore right-hander retired the side in order in the fourth, five, and sixth innings, getting five ground balls for outs. Taunton added some insurance in the top of the sixth inning. Sophomore Tayah DeCosta drew a two-out walk, and courtesy runner Kylie Thorpe advanced to third on a single from Rylie Murphy (Abigail McDonough re-entered to run). Senior Jaime Brown knocked both runners in with a double to left field to increase the score to 7-0. Taunton softball (2-0 Hockomock, 3-0 overall) is back in action on Friday when it visits Foxboro. King Philip (1-2, 1-2) returns to PAL on Tuesday to host Bishop Feehan.